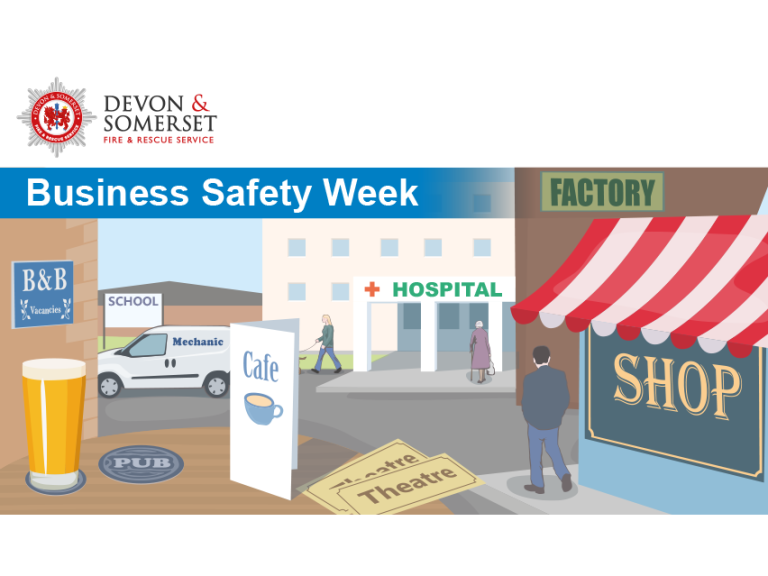 Devon & Somerset Fire & Rescue Service will be offering businesses safety messages as part of the National Fire Chiefs Council (NFCC) UK Business Safety Week 2018. The week runs from 10 - 16 September and aims to ensure businesses and their staff have the information they need to prevent, protect and respond to fire incidents in the workplace. It is also the ideal opportunity for the Fire Service to remind employers of the need to review fire risk assessments, training and make sure existing staff know the importance of fire safety. The week has also been scheduled to run at a time when many businesses will be recruiting additional members of seasonal staff in the run up to the Christmas period. These new recruits may not have the same level of fire safety awareness as permanent members of staff, and may not be aware of the steps needed to protect themselves, their customers and colleagues. Information can be found on the Fire Services website for businesses owners and managers explaining what must be done to ensure their business complies with Fire Safety legislation, and therefore make their premises safe to work in and visit.